According to the Cleveland Clinic, a nebulizer changes liquid medicine into fine droplets (in aerosol or mist form). These machines are available in a portable variety or powered by compressed air and plugged into an electrical outlet. Nebulizers are used to treat the symptoms of conditions like chronic obstructive pulmonary disease (COPD), asthma, emphysema and chronic bronchitis. When medications like Ipratropium and Albuterol are used, these treatments can improve breathing by opening up bronchial tubes in the lungs. 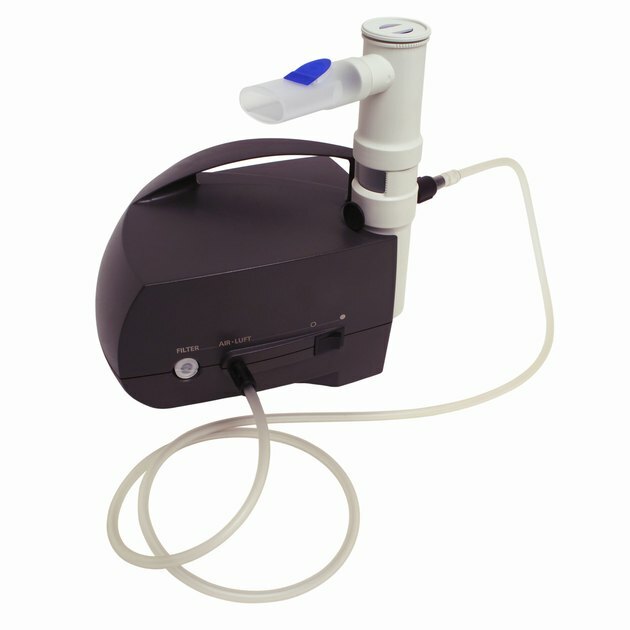 Nebulizers can be used at home, or in a hospital or another medical setting. For those with lung conditions, treatments may be used several times a day or only when the condition is acute. According to the Mayo Clinic, emphysema and chronic bronchitis are the two main conditions that make up COPD. Most COPD is caused by many years of smoking and can be prevented by quitting before irreversible damage is done. Treatment for this condition includes controlling symptoms with medications like bronchodilators, inhaled steroids, oxygen therapy and nebulizer treatments. Acute bronchitis causes an inflammation of the lining of your bronchial tubes and can cause coughing, shortness of breath, wheezing and chest discomfort. This condition can develop due to a cold or respiratory infection, according to the Mayo Clinic. Treatments include medications to help open the airways and improve breathing. Nebulizer treatments may also be helpful for treating acute bronchitis. Asthma, a common condition that causes the airways in your lungs to become inflamed and constricted, is a chronic affliction that can be life threatening. Those with asthma will want to have medications at the ready, should an attack occur. Managing asthma can be done by avoiding triggers and with various long-term medications. According to the Mayo Clinic, relaxing airway muscles with albuterol and bronchodilators via nebulizers is an effective method of treatment. Other medications that relieve airway inflammation are corticosteriods, such as prednisone and methylprednisolone. Nebulizers can be used to disperse a variety of asthma medications. What Are the Treatments for Bronchial Pneumonia?